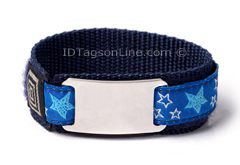 Sport ID Bracelet, IDSP46 (ID Tag size 1-1/2" x 3/4"), is made from .062" thick premium grade Stainless Steel. Blue adjustable wristband allows max length of wrist 6.5". We can engrave 5 lines on the front and 5 lines on the back (16 Characters in each line) of personal or medical information on the tag.